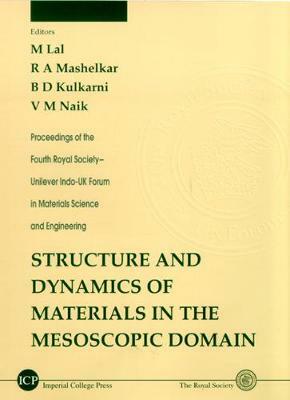 The mesoscopic domain encompasses structures that are best described in terms of the time and length scales which lie between the two extremes of the molecular and the phenomenological description of materials. Important examples of such structures are self-assemblies, emulsions, gels, colloids aggregates and macromolecules networks. Discussing the key advances made in recent years in our understanding of both equilibrium and dynamic aspects of mesoscopic structures, most talks at the conference were given by world class researchers in the field, who included, among others, Prof J S Higgins, CBE, FRS (Imperial College, London), Prof D Frenkel (FOM, Amsterdam), Prof M E Cates (Edinburgh), Prof R C Ball (Warwick), Prof S Ramaswamy (Indian Institute of Science, Bangalore), Prof R Pandit (Bangalore), Dr J A Yeomans (Oxford), Prof S Puri (JNU, New Delhi), Dr D Langevin (CRPP, Bordeaux), and Prof W G M Agterof (Unilever Research, Vlaardingen).